Piles in the bedrooms, piles in the bathrooms, piles in the laundry room, piles on the living room couch, piles in the closets… Piles and piles of laundry everywhere. Laundry has alway been my arch nemesis. It was when I was a teenager and it especially was once I became a wife and mom. But, today I can proudly say that I have defeated my laundry monster! And guess what?! You can too!! I have some tips I want to share with you that have helped me finally overcome the greatest of my housekeeping obstacles! These few things have saved me so much time, energy, and headache. I’m not sure why it took me so long to realize how much less of a pain laundry could be! Of course, laundry is never “caught up” or done. So now that I got that out of my system, here’s my tips on tackling that laundry monster hiding in every nook, cranny, and couch in your house! Tips to Defeat Your Laundry Monster! 1. Do not keep baskets in the laundry room for the dirty laundry. I know this one seems weird. But trust me. Just trust me. 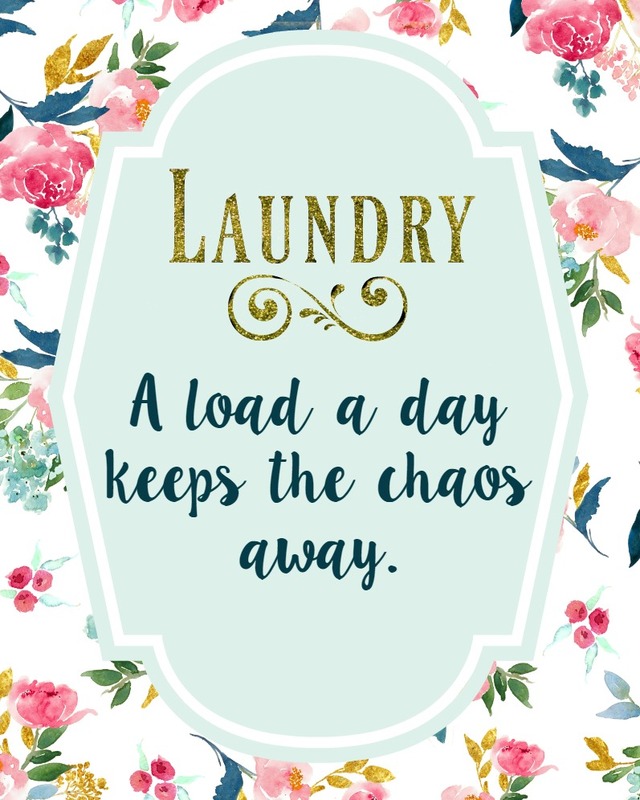 When you have dirty laundry and clean laundry baskets next to each other because you were in a hurry and couldn’t get to the clean before the children (and hubs) started rifling through, it will all just get mixed and mingled and before you know it it’s ALL dirty cause everything’s gotten out oF CONTROL!! AHH! 2. Use separate baskets for different peoples. This may sound like a lot of extra baskets, but I promise, you’ve already got like 20 baskets and just don’t realize it! Get a separate basket for your towels, each child, and each adult. Now I’m going to let you in on a dirty little secret of mine… I don’t sort laundry. With the exception of towels, I do not sort the gazillions of clothes into colors, whites, darks, etc. I have attempted this in the past and for me it’s a complete waste of time. We are simple people with simple clothes so this works fine for us. We keep a basket in each bedroom and the master bathroom. The bathroom has a basket for towels and one for children’s clothes. My hun and I just put ours in our own baskets in our closets. Now, why have separate baskets strewn about the house? Well I’ll tell you…. 3. Only do one person’s basket of laundry at a time. You can combine kid/kid baskets or adult/adult baskets, but NEVER mix children’s items with adult’s items if you are needing to create a full load. Cause here’s the thing, see? If you have only one person’s clothes per basket it will take a fraction of time to fold, hang, and put away than if you are sorting through the basket making dozens of piles and then running all over the house putting everyone’s random laundry away. Ugh! You will always know if you or someone else has clean clothes instead of finding that the normal size load of laundry you washed actually contained only one pair of your own underwear, a single sock, an old t-shirt, and 800 items of your children’s clothes. This will ensure that each person has clean socks, underwear, shirts, pants, etc. all at the same time! Yay! 4. NEVER start another load until you have started folding the one in the dryer. This will start a huge cycle and you may never get caught up. You will end up with a mound of clean setting in front of your dryer for who know’s how long. Start the next load washing just before you pull the dry out to begin folding. Then if something comes up and you can’t fold the next load you will only have one load of clean hanging out in your dryer instead of 2 or 3. 5. Use the same basket for dirty and clean. Wait… Huh? After you start the load of laundry washing move the empty basket in front of the dryer. Once the clean is dry use the basket to carry the clean laundry to your folding site. When it’s finished being folded you can place all folded items into it to make putting away easier. Because you washed the laundry from this one basket, only one trip per basket will be necessary, as it will contain only one person’s laundry and it will all go to one place! After it is finished being put away, simply set the basket back in its rightful place in the same room and it’s ready for the next round! Boom! 6. Have everyone put away their own laundry. I have a 6 yr old and 8 yr old who both put away their own laundry. They even occasionally fold their own as well. And let me tell you, they are absolutely capable of doing both! So don’t be afraid to have your littles put away their own laundry. I just call them to my folding site and have them take their now clean filled laundry baskets to their rooms! If I’m home alone I fill their baskets and leave them waiting for their return! 7. Make folding laundry a treat! I can hear you; What’s this you say??? How dare you use the word treat and laundry in the same sentence! Just hold on now. It will all make sense if you will hear me out. Choose a folding site where you can watch your favorite show, listen to your favorite tunes, or watch your favorite kiddo’s play while you work! If you limit yourself to certain activities while you fold laundry you will look forward to it! I always choose my most anticipated show (umm… TWD anyone?!) to watch for laundry folding. I don’t allow myself to watch this show unless I’m folding laundry. It’s helpful that we have Netflix and I can watch my show whenever I can get around to laundry, but even if you don’t have that option that’s okay! If you know what you want to watch comes on at a certain time you can SCHEDULE your folding for that time! Yeah! Just be sure whatever you decide to do, it’s something you look forward to and you stick with only doing it when you have laundry in front of you, and you will stay motivated! 8. Bonus! Let’s talk socks and a free printable! If your family has a really hard time keeping socks together, even before the dryer eats at least half of every pair, then this is for you! I also made this super cute free printable just for you to hang in your laundry room! Click here to download printable. There you have it! These 7 tips are what I do to defeat my laundry monster and keep it under control! Obviously, we all lead busy lives and it won’t always work out this way. I do get behind on occasion, but when that happens, I just implement these things and I’m back on track in no time! What about you? What things do you do to keep your laundry from taking over your life? Be sure to Pin this to reference when your laundry seems to be overwhelming you!